Like his father, George Zwilling was a well-known baseball player in Cincinnati. Like his father, he would fight for his country in a World War. But unlike his father, George Zwilling wouldn't come home. George C. Zwilling was born in Cincinnati, Ohio, and attended St. Francis and Rothenberg schools. Like his father, Charles, George became a well-known semi-pro baseball player in the city, playing shortstop with the Schoenling Brewery and Rauh Shirt Company teams. In the fall of 1941, Zwilling was signed by the Cincinnati Reds and assigned to the Columbus Red Birds of the Class B South Atlantic League for the 1942 season. But on October 20, 1941, before he had the opportunity to pull on the Red Birds' uniform, Zwilling entered military service at the Fort Thomas Army Reception Center in Kentucky. He took basic training at Camp Wolters, Texas, and in May 1942, Private First Class Zwilling was on his way to Northern Ireland with the 135th Infantry Regiment, 34th "Red Bull" Infantry Division - the first American servicemen to reach the European Theater. On April 25, 1942, despite overcast and blustery conditions, Zwilling played in a ball game between two battalions that attracted an inquisitive crowd of Irish folk. 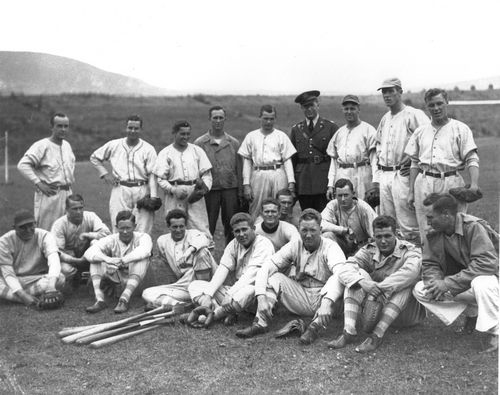 Games continued to be played whenever the troops had respite from their training routine, and on July 4, 1942 - to celebrate Independence Day - the first officially recognized baseball game in Ireland since the First World War, took place at Windsor Park, Belfast. Zwilling played shortstop for the 34th Infantry Division Midwest Giants against the 1st Armored Division Kentucky Wildcats. In front of an enthusiastic if somewhat bewildered crowd of locals and dignitaries, Zwilling was 2 for 3 at the plate in the Midwest Giants' 3-2 win. After a couple of days, they were released by the French and by February 1943 the 34th Infantry Division was in Tunisia advancing towards Rommel's Afrika Korps, who were in retreat from the British. Zwilling's last letter home said, "keep your fingers crossed," because he hoped to be home on furlough in a couple of months.2 Under the command of the British IX Corps, the division was assigned to break through the German defenses. On March 27, 1943, the division prepared for its first major attack of the war at Fondouk Gap. The German forces were well prepared with defensive positions burrowed in the solid rock. The approaches were bare and flat, with barbed wire and minefields on the bottom slopes of the hills. The operation was a head-on assault in the face of the enemy and casualties were heavy. Private First Class Zwilling was killed on March 31, 1943. The following day the division was ordered to abandon its efforts and to withdraw to a temporary line until further plans could be made. On May 1, 1943, a requiem high mass was held for George Zwilling at St. Francis Seraph Church, near his home in Cincinnati, and attended by soldiers from the Fort Thomas Army Reception Center. He was buried at the North Africa American Cemetery in Carthage, Tunisia. 1. Cincinnati Times-Star, January 13, 1943. 2. Cincinnati Post, April 16, 1943.